Taking the stoke of SUP to the next level! 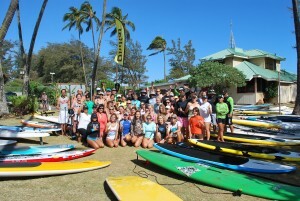 What a sight to see for a one of a kind SUP event! Sandy, sweaty and wet participants and spectators alike were entertained and could not believe their eyes when those who took part, after the ocean paddle had to complete a whacky fitness course! 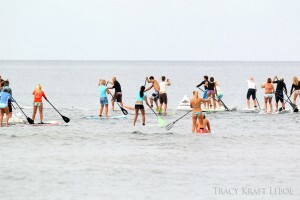 Paddling around three buoys, then dropping down on the sand to crawl 20 feet under caution tape and then to a zig zag cone run, push ups and then taco rolls that had everyone rolling in laughter and good cheer. 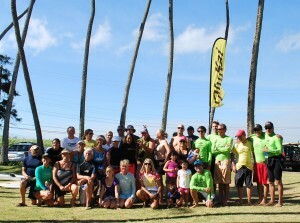 Everyone finished and then plunged into ocean to rinse sand, but the smiles were still bright. Forrest Gump’s says “life is like a box of chocolates and you just don’t know sometimes what your gonna get”. Well, I guess I got the bad piece early on in my life but now I see it as a life’s blessing. I have more stripes I ‘ve earned and now I want to share those stripes of courage and strength to others who could use some support and understanding. I can and will help anyone who asks. Get on the water with me now!